The name Vega has been synonymous with quality-crafted banjos for well over a century, and C.F. 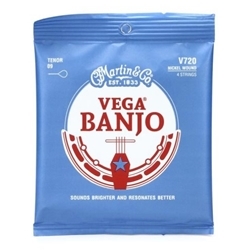 Martin & Company have applied the name and the same high-quality standards to the production of their Vega nickel-wound, tin-plated steel core banjo strings. Martin selected the long-lasting nickel alloy wrap wire for its tonal quality and smooth consistency, making these strings ideal for all playing styles. Banjoists love these Martin strings.